Download rebate application forms from this page or visit the MPWD office at 3 Dairy Lane, Belmont, CA 94002 for assistance. Get paid to transform your landscape! Drought-tolerant and water-efficient landscaping conserves water, is easy to maintain, and provides long-term benefits to the environment. Our rebate amount is $2.00 per square foot of converted lawn. Applicants must be in good standing with participating water agency. Impermeable surfaces such as concrete or mortared bricks/flagstone, non-biodegradable weed block materials, over-head irrigation systems, artificial turf, or the use of high water intake plants is prohibited. To learn more about terms and conditions, rebate amounts, conversion project requirements, download an application here or you may pick up an application form from the MPWD office. For a complete list of qualifying plants click here. For tips and tools on how to design your new water-efficient landscape, check out the "Water Wise Gardening" program here. Replace your old toilets with a new EPA Water Sense Label High-Efficiency Model, which uses an average 1.3 GPF or less. HETs perform well and use approximately 62% less water. Limit 3 rebates per residential service address or 6 rebates per commercial account. For more information and a rebate application, please click here. Or you may pick up an application form from the MPWD office. 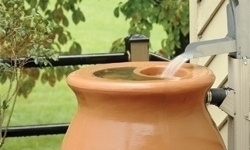 In partnership with the San Mateo Countywide Water Pollution Prevention Program (a program of the City/County Association of Governments of San Mateo County), BAWSCA and MPWD are offering rebates of up to $100 per rain barrel for the purchase and installation of qualifying rain barrels. For more information and a rebate application, please click here. Or you may pick up an application form from the MPWD office. © 2019 Mid-Peninsula Water District. All Rights Reserved.